Artists from France: Paintings and Prints from the Art Museum Collection showcases a number of artists who were working in late 19th to mid-20th century France. It was a time of change and development, and Paris was an international art center. Artists flocked to Paris to attend reputable art academies, study under established masters, or simply to gain inspiration. City life was vibrant and artists living in Paris were surrounded by modernization. This time period witnessed the emergence of some of the most influential art movements including Impressionism, Cubism, Realism and Art Nouveau. Guthrie Gallery Artists from France: Paintings and Prints from the Art Museum Collection showcases a number of artists who were working in late 19th to mid-20th century France. It was a time of change and development, and Paris was an international art center. 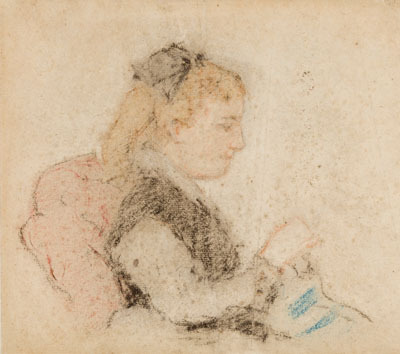 Artists flocked to Paris to attend reputable art academies, study under established masters, or simply to gain inspiration. City life was vibrant and artists living in Paris were surrounded by modernization. This time period witnessed the emergence of some of the most influential art movements including Impressionism, Cubism, Realism and Art Nouveau. Painting was a major focus at art academies and competition was fierce. Painters vied for admittance into Paris' top academies, such as the Ecole des Beaux-Arts, and acceptance into the yearly Salon exhibition was an important measure of one's success, bringing the artists publicity, patrons, and professional recognition. The city offered an abundance of historic paintings and studying the work of Old Masters at the Louvre was a common practice. Artists were immersed in the latest trends and movements. The atmosphere of Paris resulted in the formation of both formal and informal groups of painters, who often worked and exhibited collectively. New movements in painting, such as Pointillism, were dependent on the innovative thinking of painters like Paul Signac, who helped establish a distinctive style that would later influence subsequent painting movements. Printmaking served different functions. In addition to being works of art in and of themselves, prints were frequently made of well known works hanging in Paris museums, either as educational devices or as sellable reproductions. Prints were also used to illustrate books and publications. 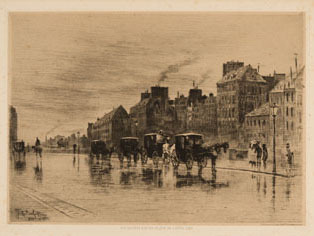 The birth of photography in 1839 impacted the print market by offering competition in the realm of mimetic reproduction, but prints maintained a stronghold, offering a unique process and final product. 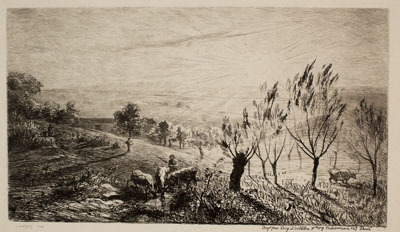 Several artists in this exhibition, including Felix Bracquemond and Felix Hilaire Buhot, were instrumental in a revival of printmaking in the 1860s. Their skill, artistry, and creativity once again made the print a viable medium for artists and distinguished it from the function of reproduction prints. From 2006-2008, with the support of the Institute of Museum and Library Services, the University of Wyoming Art Museum underwent an extensive survey of its collection. Areas of strength and those for potential growth were identified. One of the areas of distinction in European art is that of French paintings and prints from the late 19th to mid-20th centuries. It is from these holdings that Artists from France has been selected.